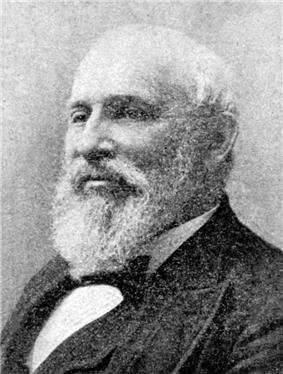 William Taylor Adams (July 30, 1822 – March 27, 1897), pseudonym Oliver Optic, was a noted academic, author, and a member of the Massachusetts House of Representatives. In 1846, Adams married Sarah Jenkins, with whom he had two daughters. Adams served as a member of the School Board of the Town of Dorchester, Massachusetts, and later of the City of Boston,for 14 years. Adams served as a member of the Massachusetts House of Representatives, for the 5th Norfolk District, from January 6, 1869 to January 5th 1870. Adams first began to write at the age of 28, and his first book, Hatchie, the Guardian Slave (1853), was published under the pseudonym of Warren T. Ashton. 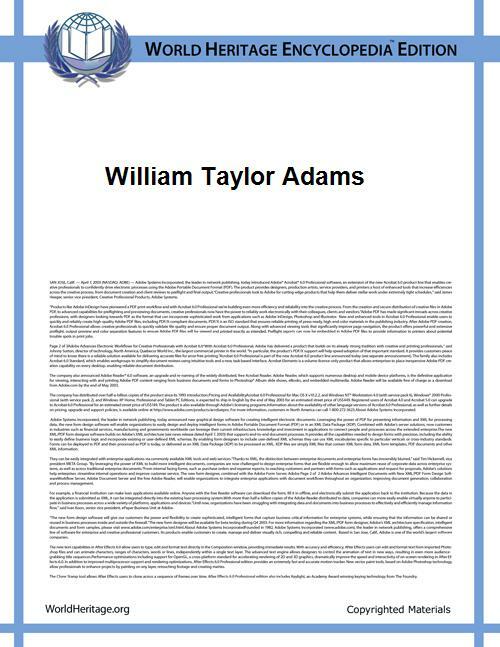 It was only a modest success, but Adams was undaunted. 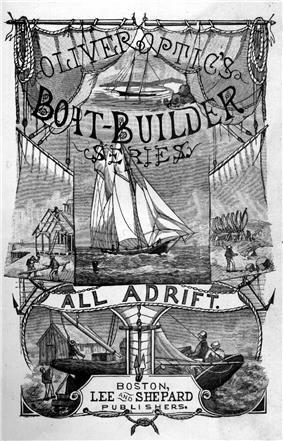 In 1855 Adams produced his first real hit, the initial volume in the Boat Club series. Adams continued to write until he died in Dorchester, March 27, 1897. Among his best-known works were the two "Blue & Gray" series, which were set during the Civil War. Adams wrote well over 100 books in total, most of them for a boy audience, and the majority of these in series of four to six volumes. He never wrote under his own name. Though "Oliver Optic" was the pseudonym he used most, his work also appeared under the bylines "Irving Brown," "Clingham Hunter, M.D.," and "Old Stager." Like many children's authors of his day, he was additionally an editor, and many of his works first appeared in Oliver Optic's Magazine. Adams' writing was criticized by Louisa May Alcott, among others. Alcott used her story Eight Cousins to deplore Adams' use of slang, his cast of bootblacks and newsboys, and his stories of police courts and saloons. Adams responded in kind, pointing out Alcott's own use of slang and improbable plot twists. ^ Warner, Oliver (1869), Acts and Resolves Passed by the General Court of Massachusetts in the year 1869, Boston, MA: Secretary of the Commonwealth, p. 906. ^ a b Warner, Oliver (1869), Acts and resolves passed by the General Court of Massachusetts in the year 1869, Boston, MA: Secretary of the Commonwealth, p. 394. ^ a b Warner, Oliver (1870), Acts and resolves passed by the General Court of Massachusetts in the year 1870, Boston, MA: Secretary of the Commonwealth, p. 2. ^ Warner, Oliver (1870), Acts and resolves passed by the General Court of Massachusetts in the year 1870, Boston, MA: Secretary of the Commonwealth, p. 416. ^ a b c d e f g Jameson, Ephraim Orcutt (1886), The Biographical Sketches Of Prominent Persons And The Genealogical Records Of Many Early And Other Families In Medway, Massachusetts, 1713–1886, Millis, MA: E. O. Jameson, p. 3. ^ Jameson, Ephraim Orcutt (1886), The Biographical Sketches Of Prominent Persons And The Genealogical Records Of Many Early And Other Families In Medway, Massachusetts, 1713–1886, Millis, MA: E. O. Jameson, p. 116. ^ Jameson, Ephraim Orcutt (1886), The Biographical Sketches Of Prominent Persons And The Genealogical Records Of Many Early And Other Families In Medway, Massachusetts, 1713–1886, Millis, MA: E. O. Jameson, p. 1. ^ a b c d Jameson, Ephraim Orcutt (1886), The Biographical Sketches Of Prominent Persons And The Genealogical Records Of Many Early And Other Families In Medway, Massachusetts, 1713–1886, Millis, MA: E. O. Jameson, p. 2. ^ Jones, Dolores. An 'Oliver Optic" Checklist, 001; Wright, Lyle H. American Fiction, 1851–1875 Volume II, 25; Who Was Who in America: Historical Volume, 1607–1896. Chicago: Marquis Who's Who, 1963.